I got home from work at 6:30 yesterday evening and my husband was already in the back yard with Dooley. It was dark outside, but the light from our Christmas lights (we decorate our back yard for Christmas) was illuminating the grass and trees. 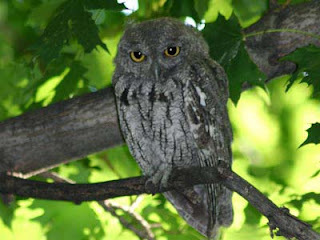 My husband called my cell phone to inform me that on the lowest branch of the ever green tree there was an owl perched. I tip-toed outside to see the softball-sized owl watching us in our back yard. My husband went inside to grab the camera, but we never could get a good photo of our guest. It was so exciting to see the owl in our back yard. I think it was Ron Weasley's owl, Pigwidgeon, visiting us.